The Movement was the preeminent poetical grouping of post-war Britain. 'We shall have stamped our taste on the age between us in the end', boasted its most important poet, Philip Larkin, of his and Kingsley Amis's influence. That Larkin's boast proved well-founded even those who deplored Movement taste have agreed. According to Randall Stevenson, author of volume 12 of the Oxford English Literary History, English literature 'was never more static than under the influence of the Movement. If the later twentieth century proved a difficult period for poetry, it was in large measure because it took so long to realise this, and move on.' Moving on, though, was just what the Movement writers - Larkin, Amis, Thom Gunn, Donald Davie, Robert Conquest, John Wain, D.J. Enright, Elizabeth Jennings, and John Holloway - thought they were doing, even when deploring innovation and experiment. Was their influence, as detractors claim, stultifying, a lament for 'England gone'? What, moreover, of other charges: that Movement writing is dry, academic, insular? 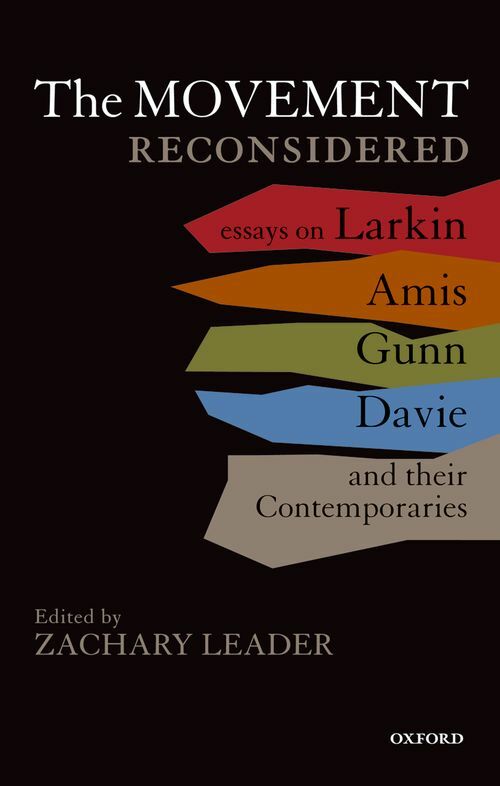 These accusations are as extreme as the anti-modernist accusations that sparked them, in particular those of Amis, Larkin, Conquest, and Davie. The Movement Reconsidered, a collection of original essays by distinguished poets, critics, and scholars from Britain and America, sets out to show not only that relations between Movement and other post-war British writers were more complex and nuanced than is usually suggested, but that the role these relations played in shaping the current literary scene is important and complicated. Other topics it examines include the origins of the grouping; the role of mediating figures such as Auden, Empson, and Orwell; the part the writers themselves played in promoting the grouping; the interlocking network of academics, journalists, and editors who aided them; and analogous developments in other fields, notably philosophy, politics, and language. The book's ultimate aim is to encourage readers to come to Movement writing with fresh eyes and to gain a fairer sense of its range and power. Zachary Leader is Professor of English Literature at Roehampton University. He has also taught at Cambridge, Harvard, Caltech, Universite Rennes 2, Haute Bretagne, and the University of Chicago. He is a scholar of the English Romantic Period as well as of modern British and American writing. Among his books are studies of William Blake's Songs of Innocence and of Experience (1981) and Revision and Romantic Authorship (1996). He has edited the Oxford Authors Shelley (with Michael O'Neill, 2003), an anthology of non-canonical Romantic period writings (with Ian Haywood, 1999), the letters of Kingsley Amis (2000), and a volume of original essays on modern British fiction (2002). His authorised biography of Kingsley Amis was one of three finalists for the 2008 Pulitzer Prize in Biography. In 2008 he was elected a Fellow of the Royal Society of Literature.